You may be wondering what a Tattoo removal machine actually is. Well first of all there isn’t just one type of tattoo removal machine. When someone says this they could be referring to a few different machines. I am going to tell you about the most famous ones here. The most common Laser used is the Q switch machine. Q switch simply is referring to the physics behind how this laser works. I am not going to go into that but simply this machine works by using certain wavelengths to target the skin and break up the ink. This ink is then removed from the body by your own immune system. It does successfully remove a tattoo but takes between 10-20 treatments to do so. The treatments need to be spread out with a gap of about 6-8 weeks to allow your skin to fully heal. You may have heard of different types of Q switch machines. This is true, there are particular machines which are better at targeting certain coloured ink because they emit a different sort of wavelength. The newest Q switch machine can target all coloured ink but actually is not as powerful as the more targeted, older Q switch machines. So depending on your tattoo it is still best to use an earlier machine which will directly target one of the colours in your tattoo. You would just need to check out what is best for you with a professional. The most recent tattoo removal machine is called the PicoSure machine. It is in advance of all the Q switch machines. The PicoSure machine uses a different technology to the Q switch machine but it still breaks the ink up into tiny particles to be absorbed into the blood stream and removed from your body. The PicoSure machine is more targeted and so is better at leaving the surrounding tissue untouched. The great news also is that it requires far less treatments, sometimes as little as 3-5 and the gap between treatments is also less at 4-6 weeks. So there you have the common tattoo removal machines. 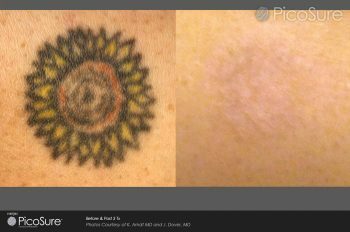 To find out further information about Pulse Light Clinic’s tattoo removal prices, please visit this page.